I had hoped that with the extreme depression I dealt with last fall through this past summer, I would find respite for the sacrifice of almost a year, but alas, it has not come to pass. While I sit in my husband’s big, comfy chair with the sun streaming upon me from the window on my right and a lightbox2 emanating its beneficial, full spectrum rays of light from the floor to my left, I write this post because I am not sure what else to do. It is taking quite the effort to continue typing as I would prefer to simply proclaim that I am depressed and go back to bed. After all, I am running on five hours of sleep! =) However, I go on, and that is the good news. I have no specific piece of knowledge to share through this post. I suppose I simply wanted to share…share that while I am experiencing moments of exceptional despair, I am doing better than muddling through…share that even though the concept of hope has become a bit tarnished once again, I am still endeavoring to move forward. 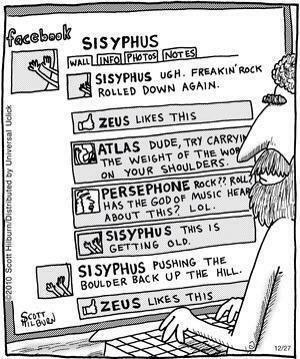 I am beginning to really identify with Sisyphus and his darn rock. But he keeps rolling it upward, and I will continue to do the same, for as long as I might. 1 American Psychiatric Association. (1994). Diagnostic and Statistical Manual of Mental Disorders, Fourth Edition. Washington, D.C.: American Psychiatric Association. 2Learn more about light therapy (phototherapy) for treating depression, Seasonal Affective Disorder (SAD), and other illnesses at http://www.webmd.com/depression/tc/light-therapy-topic-overview. No matter what problems you are struggling with, hurting yourself isn’t the answer. Call 1-800-273-TALK (8255) to talk to a counselor at a Lifeline crisis center near you. This entry was tagged anxiety, Bipolar, borderline personality disorder, Defeat, depression, Light Therapy, mental health, mental illness, recovery, support system. Bookmark the permalink.